Perhaps you have heard that most plants will not grow under or near a Black Walnut tree. Even an area that once held a black walnut could still pose problems since roots might still be in the soil. Onions are one vegetable tolerant of the toxic juglone given off by the black walnut tree roots. If you have a spot where other vegetables won’t grow, try onions. You can plant onions as early as January or February if you can safely work the ground during one of those warm, snowless, iceless days that often surprises us during the winter months. Onions will stop growing during snowfalls and freezes, and then grow again during the warm days. August, September, and October are the months to put in a fall crop. To find the dates specific for your area, check with your local University Cooperative Extension Service office. Check with the Extension Service or seed catalog descriptions for the best type of onion for your area. Generally, short-day varieties are best for southern areas and regions that receive about 12 hours of daylight. Long-day onions do best in northern gardens, or anywhere daylight lasts about 14 hours. Onions (Allium cepa) are biennial vegetables. You can purchase onions to plant in three stages of development. Onion sets are small dried bulbs. You can also find onion plants. These are seed grown onions ready to be set out in the garden. Additionally, there are seeds you can grow yourself. You can start your own onion seeds indoors 10-12 weeks before the frost free date in your area. For best seed germination, the soil temperature should be 50 degrees F. It only takes 4 to 5 days for the onion seed plants to emerge. If tops grow too tall and begin to droop, trim back to about 3 inches tall with scissors. After hardening off, transplant into the garden, 2 to 4 weeks before the last frost date. In the garden, choose a sunny, well-drained spot with plenty of rotted manure or compost worked into the soil. Onions are heavy feeders. Space onion sets 2-3 inches apart, pointy side up, in rows 1 ½ feet apart. Do not plant onions in the same spot where they or anything in the onion family was growing within the last 3 years. Plant large onion sets 2 inches deep if you want to pull them as green onions. You can mound the soil as the onions grow to produce longer white “puller” onions. If you want large “keeper” onions use small bulbs, no larger than ¾ inches in diameter, and barely cover the surface of the sets. For longer keeping onions, set out onion plants. Long season growers can direct seed in spring when the soil reaches 50 degrees F. Plant seed ¼ inch deep, ½ inch apart, in rows 12 to 18 inches apart. If you want large bulbs, then thin to space them 4 inches apart. Space them 1 inch apart for green onions. Onions have shallow root systems and need consistent moisture and good weed control. Water deeply weekly if weather is dry. Add mulch to retain moisture and suppress weeds. You can harvest onions at any stage for green onion use. You can even use the pieces you thin out to give dishes a little onion zing. For storage onions, check on bulb readiness by tugging on the tops. If there is resistance, then the roots are still growing and you can leave the bulb in the ground. Pull them after the tops fall over and begin to brown. 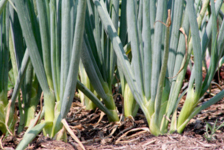 If the weather is turning hot, the onions, especially those grown from sets, have a tendency to bolt (send up a flower stalk, a shoot from the middle of the onion), which makes them hot and tough as green onions and prone to spoilage as dried onions. If your onions do bolt, pull and use them as quickly as possible. To beat the heat and force bulb maturity before the onions can bolt, cut the onion tops back to about 4 inches and harvest them a week later. Sweet onions and storage onions grown from sets do not store for any length of time, often less than 2 months. Use them first. Storage onions grown from seeds or plants keep the longest. After pulling the large onions for storage, lay them out on top of an old window screen elevated off the ground for a few days to dry out. Morning sun and afternoon shade with good air circulation is the best curing site. Best keep them out of direct sun if you pull them in the heat of summer. Like the gardener, onions can sunburn, which can turn parts mushy  on the onion, hopefully not the gardener. Knock off the dirt and store them indoors in a cool, dry, dark spot. You can braid the tops and hang them or remove the tops, leaving about an inch of stem, and lightly pile them in mesh bags. Onions are easy to grow in the garden. You can stop paying those exhorbitant prices at the super market. Just grow your own.